The Mobile Phone of Tomorrow: What might it look like? What might the mobile phone of the future look like? Ken’s Tech Tips tries to imagine what it might look like and how it might work. The launch of Apple’s App Store in July 2008 marked the turning point for the mobile phone as a software platform. Looking back, it’s a wonder why it took so long – now everyone’s trying to get in on the game. There’s an app store for every platform – application stores include Android Market, Blackberry App World, Ovi Store, Samsung Apps and Windows Marketplace just to name a few. We’ve seen lots of innovation in the application space over the past year or so and I believe that this will continue at an even greater pace in the coming years. Your mobile phone is a very personal item. How many other things in life do you take with you everywhere you go? It’s the first thing you check in the morning, the last thing you check at night… you take it on holiday with you and then curse it when your boss calls to ask where you filed the stapler. With the mobile phone being such a personal item, it’s no wonder why people have really taken to customising their phones and finding new things to do with it. Looking forward to the next decade, there is a huge potential for new mobile applications which will improve and change the way we live our lives. Smarter, prioritising smartphones: With access to your location and schedule, tomorrow’s smartphone will learn to be “smarter”. Using machine-based learning techniques, tomorrow’s smartphone will learn to prioritise calls, texts and other incoming messages/communication based on how you interacted with them in the past and the context of the interaction. Think of it like a “spam filter” or a “Gmail Priority Inbox” for your entire life. Your smartphone should act more like a personal assistant and work for you rather than helping you to procrastinate by distracting you when you least want it. Travelling from A-to-B: Whilst information technology can bring down communication barriers, we’re still limited in how fast we can travel in the real world (speed limits, public transport timetabling and so on). Obviously there’ll never be a mobile phone application which can make your car run faster or the buses run on time, but your phone should be smarter about how it helps you to get from A-to-B. One app should be able to combine data about traffic conditions, train times, fares, Zipcar availability, etc. and bring it all together to make an informed decision. Your NFC-enabled phone should pay for your Tube fare, unlock your Boris Bike and Zipcar and act as a electronic ticketing solution for the trains so queues should be things of the past. Translation Applications: Following in the footsteps of Google Goggles and Google Translate, I foresee that the mobile phone of the future will bring down language barriers by translating everything you see, hear and say between languages in real-time. International calling and roaming is great: you can practically reach anyone on the globe right now by dialling a couple of numbers on your phone. 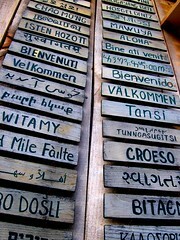 Yet in order to communicate with them, the language barriers need to be brought down too. 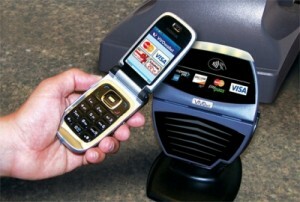 For an in-depth discussion on the future of mobile applications, see my blog post on the coming mobile app revolution. 4G technology: In 2014, we’ll begin to see fourth-generation mobile networks in the UK. With download speeds more than 10x what is currently offered by the fastest third-generation networks, many new and novel smartphone applications suddenly become possible. This include video conferencing, multi-player gaming, high-definition TV and many of the applications we’ve discussed above (all of which rely on being able to query many data sources in a split-second). NFC (Near Field Communication): NFC provides a seamless interface between the online world and the offline world through your smartphone. By enabling communication between your mobile phone and physical real-world objects, the potential for applications such as an electronic wallet become possible. Displays: The size of the mobile phone display has gradually been growing over the past few years – now reaching a massive 4.3-inches across on the latest models of smartphones (e.g. Samsung Galaxy S II and HTC Sensation). We’re unsure whether screens will continue to grow in size nut we’re pretty sure touchscreens of the capacitive type are here to stay. Samsung recently demoed flexible displays and transparent displays – will they make their way onto smartphones soon? How about a pocket sized mobile phone with a large flexible display which would roll out like a window blind to transform your phone into a tablet? We’d also love to see a hybrid e-ink and LCD display to give better outdoor visibility. 3D displays, perhaps? 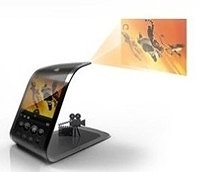 The first mobile phones with 3D displays are beginning to appear on the market. 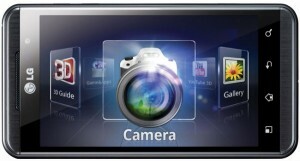 These phones allow you to capture photos and video in 3D as well as allowing you to watch them. We’re still not convinced about the need for 3D on a mobile phone – though a 3D “killer application” could change things. How about a Google’s 3D maps on a 3D display? Or a Minority Report style 3D interface? What do you think the mobile phone of the future will look like? Have we missed something out? We’d love to hear your thoughts: drop us a comment below!